We are proud to present to all of you the new version 1.1, with improved art, French language and three levels! Unfortunately, it is only available for Windows. The MAC version will have to wait for us to solve some compatibility issues, if we ever solve them. Anyway, enjoy the game and feel free to post any comments, opinions or bug reports (we hope there will not be much of these :P)! We will keep fixing little stuff and improving the game. P.S. There is a known bug that happens sometimes in the London level: after dying, the paints on the floor and walls stop working on Galahad, although they are normally painted and everything else, and restart working after a while. The reason is unkown, and it only happened a number of times. We’re working on solving it. Please, report it by commenting this post if it happens. Stand by, cause in a few days we’ll upload the v1.1 release for Windows, with all the changes we presented in our project defense, and a few more! Are you coming to Gamelab 2012? 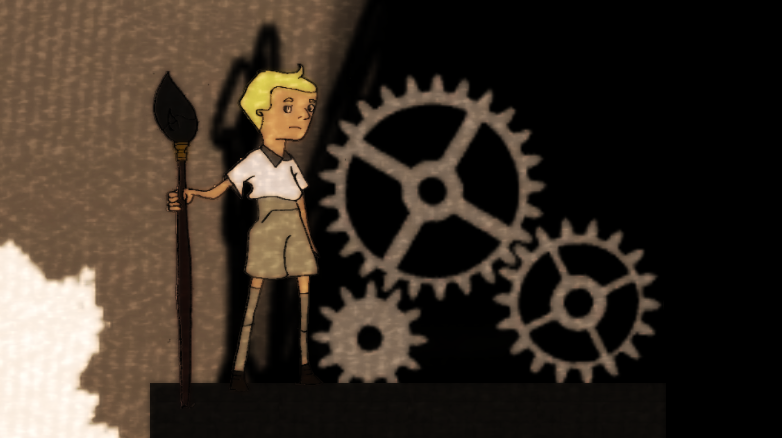 Will Galahad’s Memories be among the finalists for the “Best Academic Project” award in the forthcoming expo Gamelab Barcelona? It is about to begin in less than two weeks, and we are doing our best just expecting so! We will be there to show our last advances, with a whole new level and much more content! After the end of the expo, and thinking on those that will not be able to attend, the most updated version will be uploaded to this page, to share the game with all of you. See you soon, this time in Barcelona! We are very proud to announce the release of the last version of Galahad’s Memories! Please go to the Downloads section to get it. Gameplay: The overall game difficulty has been decreased significantly for the first levels, driving the player into the desired mood and expertise level with a slower pace. It has been achieved by decreasing the number of buttons needed to play, from 5 to 3: Instead of painting each colour of the palette with a different key/button, now you can swap the selected colour and only need a single button to paint, as easy as it sounds! Aesthetics: We have introduced a “nearly finish” look to the character, including full colours and new animations. More frames will be added in the future, increasing the quality of the character’s overall animation. The paintings and changes made in the canvas will be our next challenge: We will try to make the player feels like really changing the content of the artwork, as well as interacting deeply with the elements painted on them to obtain clues of the character’s forgotten life. Narrative: When people played the game in Ideame some days ago, they all felt a bit lost when getting around in the test level. In addition to the visuals of the level, we have included now more texts in the game: This feature allow us to drive easily the game’s flow and tell parts of the character’s story that cannot be explained with the artwork. In the next few weeks, the team will work out and develop the most important levels of the game, to ensure the story soaks the players and inmerse them deep in the story of this old artist. And that’s all for now. Enjoy the playable content and stay tunned for more news to come! Now, we just came back home from http://www.ideame.es/ and we are very happy with all the feedback received from the audience! We were so glad that people could play our game, and share their thoughts and ideas about its mechanics and aesthetics. The Galahad Team understood how difficult is to attract the attention from people with such an artistic concept with not enough visual feedback in-game, YET! That’s why we encourage you to keep holding an eye on this humble game and try out the last versions of the game that we will be uploading quite often. Sooner than you think you will be able to download the game version brought to Ideame++ in this blog in the Download section. And finally, we want to congratulate Stuffed Animalz for their award and the rest of the games for being so original!